NEW YORK (TheStreet) -- Last week was a choppy one for the markets, with leading stocks really not doing much for the most part. That has me thinking that we need some consolidation at these levels. That said, every dip has been relatively short-lived and bought heavily for well over a year. So I'll be watching closely for a quick turnaround. While the leading stocks weren't doing much, the good news is that many smaller, very cheap stocks are moving huge and are very tradable, especially on an intraday basis. There is almost always a place to make money, it's just a matter of finding it at the right time. As for gold (GLD - Get Report), it had a choppy week as well. It's resting and consolidating nicely here but it could see some limited downside in the coming week before it makes its next move higher. Let's take a look at the pretty gold chart. Gold closed the week up 0.72% and looks great for higher prices in the not too distant future. Gold has a really nice saucer bottom here. It's very similar to a powerful cup and handle pattern. I got quite a few question about that this week. Cup and handles are very powerful continuation patterns. This saucer is a bottoming pattern. That said, we are building the handle or right side of this saucer perfectly here. 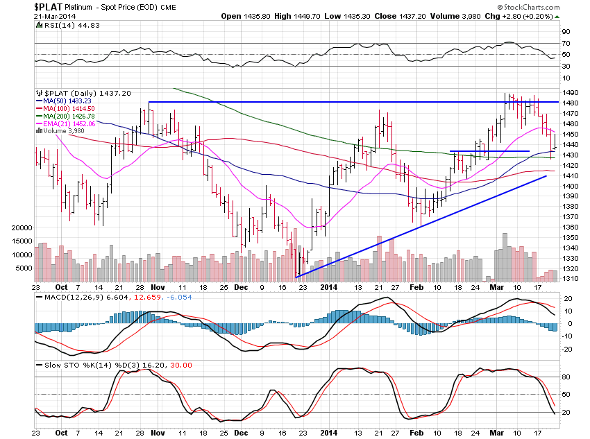 We can chop between $1,320 and $1,360 and perhaps even see a pullback to the 200 day moving average at $1,300. A break of $1,300 would not be great and would signal we need more of a correction -- but I don't see that coming. Once we break $1,360 we should quickly move to the $1,417 area. All in all, gold is behaving well since putting in its double bottom low on the last day of 2013. Silver (SLV - Get Report) lost 1.58% for the week but also looks good here. A great bull flag or handle is set up to break out soon. 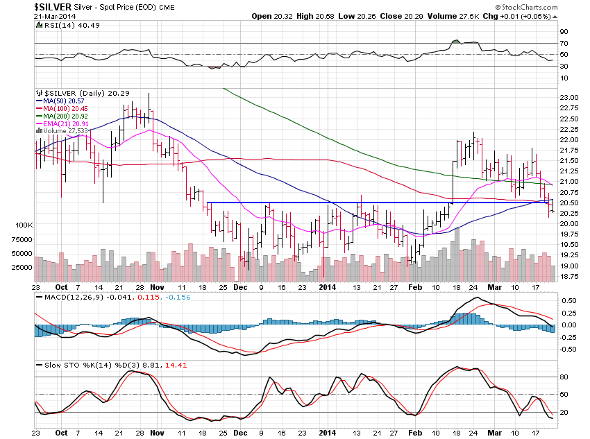 This move above $21.50 will bring us back up to $23. Gold should lead this move and there are ways to play this breakout using more leveraged instruments, but those aren't for everybody. Platinum (PPLT - Get Report) rose 2.54% this past week and is moving well right on schedule. We could rest here another couple days, but platinum looks ready for more upside here right now. This next move higher will bring us to $1,510 or so and the next major level after that is $1,550. Let's take a look at the weekly palladium chart since it's very pretty. Palladium (PAL rose 5.08% this past week and has a stunning weekly chart that points to a major breakout that will last years, not days or weeks. 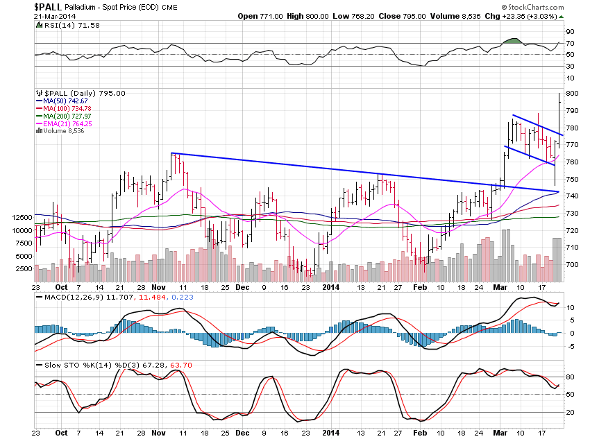 It's so, so pretty now, breaking this long trend-line and triangle pattern in a big way. Just look at the explosion of volume. Just a perfect breakout here so far. The thing about trading is you can do it using five minute charts, 60 minute charts, daily or even monthly charts. Really, on any time frame you can find patterns and buy points and each buy point coincides to the time frame you are looking at. When we look at palladium on a weekly chart breakout, it means a long strong move. To annul that, we'd need to close back under $750 on a weekly basis, not daily. Gold and silver look great on longer-term chart as well. Also of note, but it's pretty obvious, is that the size of the moves are also much larger on longer-term charts. All in all, the metals look great this weekend as they come off historic lows. I'm mostly into momentum and swing trading fast movers, not long-term moves like these. In time they will have super and fast moves. But not yet. You can find out more about what I do for members at www.wizzentrading.com.